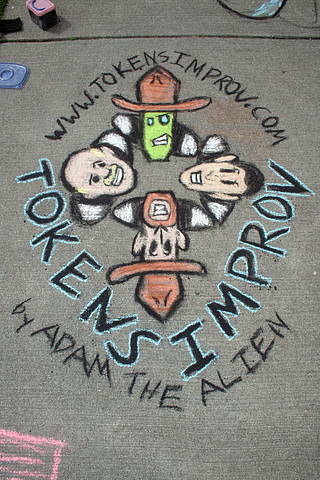 A chalk depiction of The Tokens comedy improv group. Amocat Cafe is the place to be. The new hub of culture and community in Tacoma, Amocat’s quirky rooms and multicolored walls have housed everything from painted mariners and Patty Murray to crazed clowns and cacophonous cartoonists. Now, the cafe that professes to be “your local counter-culture and political vortex” adds another rivet to its repertoire: comedy. Tonight at 6:00 PM, Amocat Cafe will feature an hour of improvisational comedy. I’m putting this together as a joint show, representing multiple local comedy groups that I’m involved with: The Tokens, Norman Tweeter Productions and the all-new Small Change improv group. The show is free, but we do suggest that you purchase a drink or a snack from Amocat’s tasty selections, and one of my many hats will be out for those who feel generous enough to tip the performers. If you can’t make it, The Tokens will be having their own performance – sans yours truly – on Sunday at 7:30pm. More info on that on The Tokens’ home page.